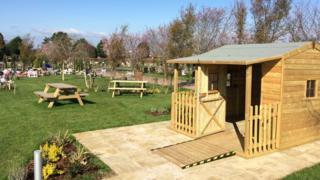 Picnic benches and a wooden hut resembling a playground have been put in the children's burial area of a crematorium. The "reflection house" and garden were placed in Cheltenham's crematorium as part of an £8.5m redevelopment. Petitioners claim it is close to children's graves and has upset bereaved parents, who want it removed. The council has defended the move and insists it "in no way resembles a play area in any shape or form." The revamped area was unveiled at the beginning of the month when the new crematorium hosted its first service. Within days, an online petition was set up protesting that the once "peaceful place to mourn" had been turned into a "playground" without any notice. Image caption Darren Balster said he was "fuming there are picnic benches feet away from my child's grave"
Around 250 people have signed a petition, including Lorraine Young, who said: "I have my daughter's plaque in the cemetery and do not want to hear the sound of children shouting while I am wanting a peaceful time with her." Kathryn Curtis said: "My grandson is buried here. Is there no regard for people's feelings?" While Darren Balster said he was "fuming there are picnic benches feet away from my child's grave". Ben Jenkins, Cheltenham Borough Council's bereavement services manager, insisted the area was "absolutely not" a playground. "It in no way resembles a play area - what it is is what it looks like a nice reflection garden," he said. "The picnic benches are so children can do their drawings and notes outside, when the weather's nice, and the hut is for children to go to write messages and leave mementos for their lost brothers and sisters. "It [the shed] does need a bit of work but the area is for everybody to come and reflect."